Nilda (Nena) Peragallo Montano, Dr.Ph., R.N., dean of the University of North Carolina at Chapel Hill School of Nursing, will deliver the spring 2017 Vanderbilt University School of Nursing (VUSN) Dean’s Diversity Lecture on Thursday, May 11, at 2 p.m. in Godchaux Nursing Annex room 161. Nilda (Nena) Peragallo Montano, Dr.Ph., R.N. Peragallo Montano’s talk, “Cultural Considerations for Research and Practice with Latino Populations,” will suggest culturally appropriate ways for practitioners and researchers to reach out to and work with Latino subjects. Peragallo Montano is a globally recognized expert on culturally competent interventions and health disparities. From 2007-2015, she was the director and principal investigator of the Center of Excellence for Health Disparities Research: El Centro, a National Institute of Health (NIH) P50 center grant, for which she currently serves as co-principal investigator. 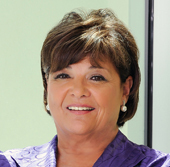 Prior to becoming dean of the School of Nursing at UNC-Chapel Hill in January 2017, Peragallo Montano was dean and professor of the University of Miami School of Nursing and Health Studies. She is a past member of the NIH/NIMHD Advisory Council, a past president of the National Association of Hispanic Nurses and founding editor of Hispanic Healthcare International. She is an adjunct professor of the Australian Catholic University Faculty of Health Sciences and a member of the National Advisory Committee of the Robert Wood Johnson Foundation Nurse Faculty Scholars Program. A fellow of the American Academy of Nursing, Peragallo Montano was inducted into Sigma Theta Tau’s International Nurse Researcher Hall of Fame in 2014. She holds a doctorate from the University of Texas, Master of Science in Nursing from the University of West Virginia and Bachelor of Science in Nursing from the University of Chile. The VUSN Dean’s Diversity Lecture Series explores the diversity of backgrounds, cultures, ideas and viewpoints in today’s world. It seeks to equip students, faculty, staff and other community members with the knowledge and understanding needed to lead nursing forward in a global society.